Car keys are not forever things. Even if we manage never to lose them, they may eventually crack, snap or become to worn to operate. The Auto Locksmith can offer an onsite car key repair for almost all broken key situations. It is a freezing cold winter day and when you try to start your car, the key snaps in the ignition. Perhaps the car lock was frozen stiff and it’s a case of key snapped in car lock? Worse, imagine if you were out shopping and when you went to open the boot (key that starts the car also opens the boot) and it snapped? You could be stuck with a potential dilemma. Not if you live in London or the Home Counties because if you are in any of those areas, you simply have to call The Auto Locksmith. Our nearest mobile unit will be despatched to mend your broken car key and get you back on the road in no time. 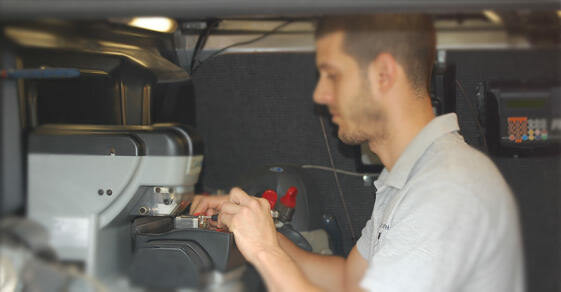 Our mobile vans are fully equipped to deal with any issue involving broken car keys. We will extract the broken key blade and re-piece it to make a new one. With newer keys that have a transponder chip that is responsible for deactivating the immobiliser, our vehicle locksmith will be able to remove the transponder chip and secure it into your new replacement key. It is worth noting that some makes of car keys can become so badly worn that they simply stop working in some or all of the locks. (Ford keys are notorious for this). You can lock your car without a problem, you just can’t open it. Or, your key starts to work with some locks but not all. Ensuring that you have spare car keys in this kind of situation is essential. Avoid an emergency and just call The Auto Locksmith. They will visit at a time convenient for you whether at work or at home. Both of my Toyota Yaris keys started to fall apart and eventually the metal part came completely out of one of the keys. Toyota quoted me over £400 for two new keys which would be more than the car is worth! After speaking with The Auto Locksmith I was happy to hear they could refurbish both broken keys for less than the cost of one new key through the dealer. Amazing service that I would happily recommend to anyone that has broken car keys.